You may be able to read this text effortlessly but don’t be fooled into thinking that reading is an easy task! It took you many years of learning and long hours in school to become proficient at recognizing letters and words. How does your brain do it? The brain consists of 10 billion cells called neurons. On average, each neuron is connected to 10,000 other neurons through connections called synapses. When you see or think of something, that input stimulus excites a neuron. If the input is high enough, the neuron passes an electric signal to the neighboring neurons, through their connecting synapses. Synapses are chemical bridges that can change their electrical resistance according to how much they are used—lower resistance if the connection between two neighboring neurons is important and higher resistance otherwise. The brain constantly creates such paths of electricity and modifies the synapses along the way, rewiring itself in order to learn and adapt to the environment. These paths can be used again and again allowing the brain to quickly recognize familiar patterns. The brain is incredibly slow in comparison with modern computer processors. A neuron in the human brain runs 200 operations per second. The transistor, a basic building block of a 2 Gigahertz processor regularly found in current smartphones, runs 2,000 million operations per second. This makes the man-made transistor a billion times faster than the biological neuron. However, computer chips live in a digital world, a world of “0” and “1” where information is either true or false, without any values in between. Computers make decisions based on first order principles, hard rules that always apply. In comparison, the brain is analog and makes decisions based on experience. Although not very good at calculating the square root of 125452221, for example, or other computational tasks, this approach is very effective at recognizing patterns. The brain also has the advantage that it handles a huge number of tasks in parallel thanks to the huge connectivity of each neuron to other neurons. Modern computer chips handle most of the tasks one after the other which slows down their operation. When exposed to a very large quantity of information, the brain is faster and has superior performance at classifying it and recognizing subtle patterns. Schematics of the 3-input perceptron. The perceptron is one of the easiest artificial neural networks (ANNs) and can classify binary objects. Inspired by neural circuits, many scientists have contributed to the development of mathematical and computational models in an effort to create artificial neural networks (ANN). Similar to the biological circuits, ANNs consist of artificial neurons and artificial synapses. One of the easiest ANNs is called the perceptron (see the figure above), which is basically the mathematical model of an artificial neuron. The artificial neuron is connected to other artificial neurons through synapses, mimicking the biological brain. The artificial neuron receives different inputs from neighboring neurons. These inputs are weighted based on the value of their connecting artificial synapse. The perceptron ANN is designed so that the artificial neuron passes the signal (“1”) to the output when its total weighted input exceeds a certain threshold; otherwise, the output stays “0”. The perceptron can be trained to classify binary objects, which belong to either one class (labeled as “1”) or another (labeled as “0”). The perceptron can recognize rudimentary patterns by being able to classify objects to either class “1” or class “0”. For example, a perceptron can learn to classify animals either as cats or not cats. 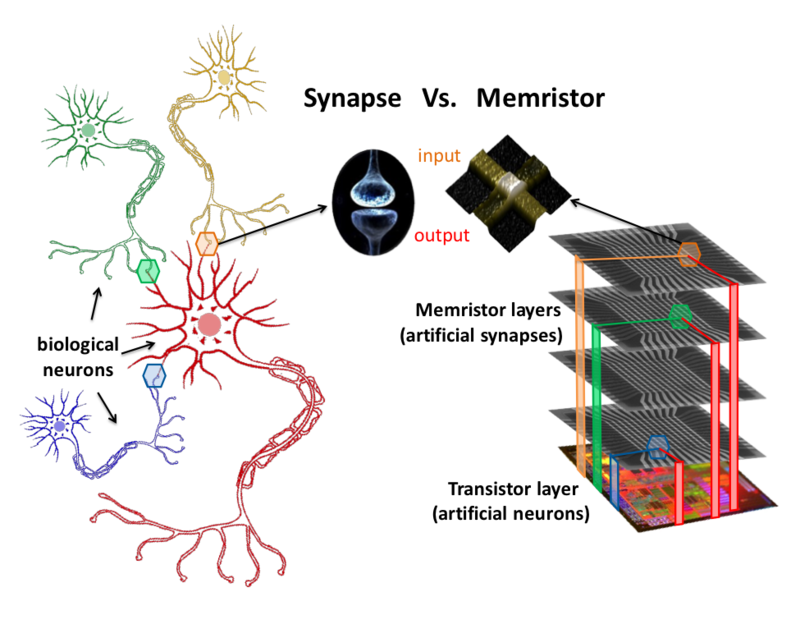 More complicated ANNs utilizing multiple layers of neurons can be used to recognize advanced patterns, such as images. The first layer of neurons can detect edges, the next layer can detect basic shapes, the third one deals with colors, and so forth, with the last layer combining all this information and recognizing more advanced features like a face or an object. Currently, ANNs implemented in software are widely used for image and sound recognition and machine learning. However, the software implementation of ANNs is inherently slow because the underlying digital computer hardware is not appropriate for such tasks. Intensive research has been pursued in the past decade in trying to find an appropriate hardware implementation for ANNs. The current digital transistor is an approximate model for an artificial neuron. What is missing is an artificial synapse that has good analog properties. Organization of the biological brain (based on neurons and synapses) versus organization of a computer chip capable of artificial neural computation (based on transistors and memristors).The memristor resembles the synapse because it has two terminals (an input and an output) and can change its electrical resistance in an analog fashion. In professor Strukov’s lab at UC Santa Barbara, our team is working on designing and fabricating memristors, candidate devices for such artificial synapses (see the figure above). The memristor, a resistor with memory, changes its resistance value based on the electric current that passes through it, just like a biological synapse. Recently, we were able to demonstrate the first integrated hardware implementation of a perceptron using these memristive devices. In the future, we plan to scale this work to more complicated circuits capable of more sophisticated pattern recognition and learning. This technology could potentially have great impact for applications in medical implants, robotics, big data analytics and image processing by allowing for fast and energy efficient processing of large amount of information. In the meantime, appreciate how complicated apparently simple tasks are, such as reading or recognizing your aunt Carla that you have not seen in 20 years. Your brain does a lot of awesome work behind the curtains to make that all that possible. Gina Adam is a 2010 fellow of the Fulbright Science & Technology Award program from Romania. Gina is currently a 5th year PhD student in electrical engineering at University of California, Santa Barbara working on memristive systems for memory and logic applications. The July edition of TGS magazine was guest edited by Gwynne Lim, a 2010 fellow of the Fulbright Science & Technology Award, from Singapore, and a PhD candidate in the Department of Plant Biology at Cornell University.